There are few phrases that erase my ability to formulate sentences more than “so, tell me about yourself.” Immediately the goings-on inside my head sound like the echo of water dripping in a dank empty cavern. And also very lucky, apparently! The “us” that we see from the inside out isn’t quite the “us” that other people perceive. The hope is that the two may come close but there are nuances and internal conversations that we carry on that no one else could factor in to their perception. You know your truth (mostly) but people look at you and build a profile based on their own information gathering. Their impression of you is based on their own experiences in the world. Maybe someone who climbs Everest wouldn’t look at a person who rides their motorcycle across the TAT as adventurous. But, maybe someone who never ventures beyond the monitor in their cubicle would. What am I about? Everything and nothing all at the same time. I suppose one of the things that I could say about myself is that I am a seeker. Information, fun, truth, love, passion, reasons, meaning – I’m always on the lookout for them. This is a big part of who I am. My interests, pursuits and passions seem to center around the search for something. That is the heart of it all. Mom, wife, motorcyclist, curious, thinky weirdo with a penchant for quirky roadside attractions, travel, and squeezing the fun-juice out of each day. That’s me. It never ceases to amaze me how hard it is for me to respond to the question or, in this case, a prompt, that requires me to describe myself. I mean, I don’t really think I’m all that deep. As you said, the us we perceive isn’t usually the same person others see. We hope the descriptions match, but we never know unless we ask. I don’t know about you, but I’d be sorta scared to ask. What if the see me as a complete, spastic, nut? I, too, see myself as a seeker. Peoples’ stories intrigue me. I often forget that I may come off as really damn nosy, asking for too much information, personal detail, that I could use for nefarious purposes, but that I’m really only inquiring about so I can understand that person’s whole story. If I don’t know, I’ll make assumptions — usually wrong or at least slightly off — to fill in the blanks. I’m also a very visual person, and love quirky/fun stuff. Things that many other people think are stupid, don’t “get” or understand the appeal of, etc. I know YOU know what I’m talking about. Your bombshell at the end of your post threw me. You HATE onions? That changes my whole perception of you. JK, of course, but I love onions and just don’t understand how people can not like them, too. I don’t think I would be willing to ask those who put up with me on a daily basis to write a phrase or word description. And I completely understand the water dripping in a cavern somewhere deep underground where there isn’t even a hope of light. There’s no shame in being nosy, er, curious about, er, interested in others. I really enjoyed the insights–I read ’em all. ToadMama, what a perfect prompt to begin a month of… of… revelations? Especially for those of us who’ve been reading y’all for a while–several years in some cases. Such backstories are always interesting. What a coincidence, I was just emailing a friend about something along the lines of this post. Part of me doesn’t really want to know exactly how (most) others perceive me. Because, so far, I have been a bit shocked! Seems like we all have something in common – going brain-dead when asked to tell about ourselves. I think I am boring – my kids have said I am brave! It’s awesome that they see me in a better way than I see myself. When I tell most people that I ride a motorcycle, they are shocked. Apparently I don’t “look like” someone who would do that! 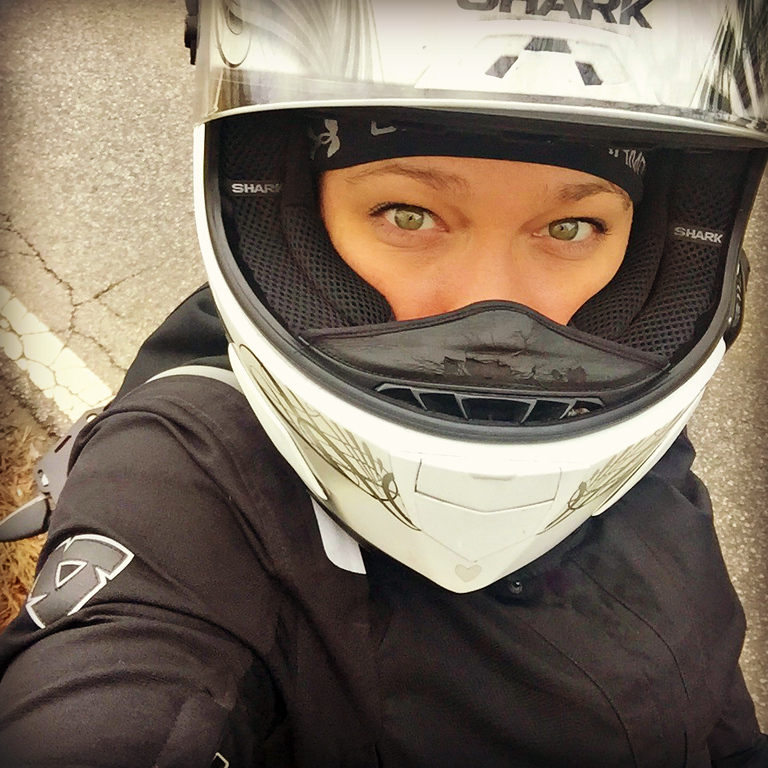 Not sure how a motorcycle-riding-lady looks but – I ride!